There's no use in arguing about it--the Grand Theft Auto series is currently the driving force behind the video game industry. So it's understandable that new installments come under heavy scrutiny--after all, how many titles are influential enough to re-define game design almost overnight? In examining the latest entry in the amoral series, one fact is clear: though the game is absolutely enormous, it just isn't as effortlessly innovative as its brilliant predecessor, GTA: Vice City. 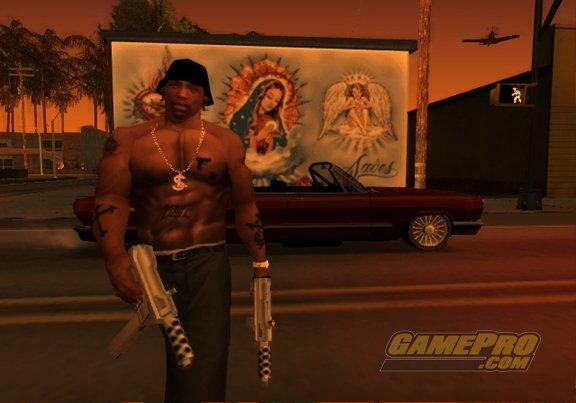 Grand Theft Auto: San Andreas starts players off in the seedy streets of Los Santos, a crime-ridden city that bears some resemblance to the grimiest districts of Los Angeles. 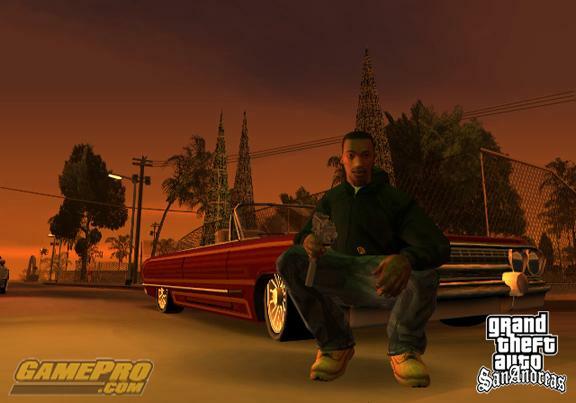 Before leaving for the richer prospects of San Fierro (San Francisco) and Las Venturas (Las Vegas), protagonist Carl Johnson (C.J.) must reunite his hometown gang and retake the neighborhood turf. But in the beginning of the game, the situation is tough; unlike Vice City, the big money-making jobs in San Andreas come far later in the game. Players will be left scrounging for cash, slaving away at low-level tasks, like cleaning out crack dens and making courier runs. In short, this is no decadent Vice City. San Andreas sports an enhanced version of the Vice City rendering engine. However, it's only a fresh coat of paint, not the radical graphics overhaul the game desperately needs. The most noticeable visual improvements come from the sharper environment textures, beefed-up character models, and enhanced character animation. Despite these welcome additions, San Andreas definitely shows its graphical age, especially upon close examination. The exterior environments of San Andreas--ranging from sun-drenched ghettos and fog-choked docks to mountainous terrain--definitely seem more solid and polished than Vice City's repetitive slums. But some areas still have a sloppy, unfinished look to them; interior environments are often bland and featureless, or suffer from heavy texture banding and dithering. As with its predecessor, San Andreas leans heavily on a dynamic rendering system that adds and subtracts world objects on the fly. But as every GTA fan knows, this can result in erratic visual behavior, such as buildings or objects popping up or disappearing for no apparent reason. Despite the dynamic rendering system, San Andreas suffers from the same framerate shortcomings that plagued its predecessors. The lack of progressive scan is also a drag, but mercifully, widescreen is fully supported. As a side note, some newer non-widescreen TVs (like Sony Wegas) can display widescreen signals in letterbox mode--if your TV supports this feature, it's absolutely worth activating. And using S-Video cables, if available, will help smooth the game's gritty, low-resolution visuals.